Mars canyon - Solar System Planets And Moons Section. Mars canyon called Valles Marineris. Despite Critical Failures, SpaceShipOne Still Reached Space. A few hours after the historic flight of SpaceShipOne, pilot Mike Melvill and designer Burt Rutan revealed that the trip to space wasn't worry free. Far from it, in fact. A technical glitch in the early moments of the rocket burn caused Melvill to lose control, and SpaceShipOne rolled back and forth. He was forced to switch to a backup system to keep the spaceship from being destroyed. Training and backup systems carried the day, though, and Melvill was able to regain control of SpaceShipOne, and gain enough altitude to just barely reach 100 km (62.5 miles). At least one more test flight is planned to ensure this mistake is resolved before risking the pilot and spacecraft on an official X Prize attempt. On 2 May 2004, the High-Resolution Stereo Camera (HRSC) on board the ESA Mars Express spacecraft obtained images from the central area of the Mars canyon called Valles Marineris. The images were taken at a resolution of approximately 16 metres per pixel. 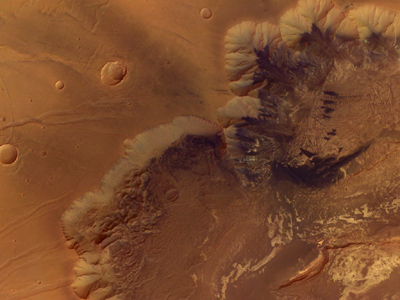 The displayed region is located at the southern rim of the Melas Chasma at Mars latitude 12ºS and Mars longitude 285ºE. The images were taken on orbit 360 of Mars Express. Cassini's First View of Iapetus. Cassini has turned to look at another of Saturn's moons; this time it's Iapetus. This image was taken on May 23, 2004, when Cassini was 20.2 million kilometres (12.5 million miles) from Iapetus. Although it's small and hazy in this picture, the Moon is much larger than Phoebe, and measures 1436 km (892 miles) across. It was first photographed up close by the Voyager spacecraft, which found that it has a light and a dark side - this duality is just barely visible in this image.